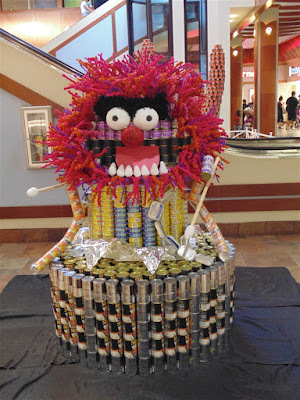 We begin our CANstruction 2015 series with “Canimal” by Albert C. Kobayashi, Inc. This is based on the Muppets band drummer Animal. Animal tears through his snare drum as he prepares for his solo debut. The drum consists of black Stagg Chili cans accenuarteted by silver Le Seur Carrots. His ever famous yellow shirt is made from Coral Tuna cans and of course who can forget his silver Sardine can chains and is Libby’s Vienna Sausage arms. This is one of my favorites this year and you can view this and all others entries at Pearlridge Uptown though October 18.You can vote for your favorites by bringing cans for the “one can one vote” audience choice. Here is a photo taken at McKinley High School where the 68th annual Friends of the Library Book Sale is just about wrapping up. If you haven’t already checked it out be sure to give it a try. 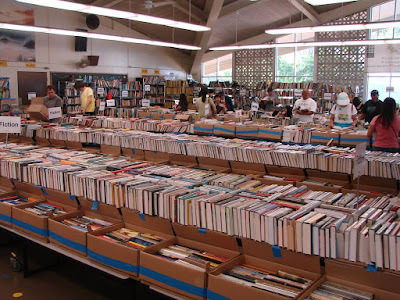 Thousands of books are available for purchase for just a few bucks. It is open from 11am to 7pm with the final days on 6/26 (11am-8pm 50% off everything) and 6/27 (9am -8pm everything 50 cents). We end the week at Ghirardelli Square with the smell of chocolate wafting through the air. Our dessert of choice was the famous Ghirardelli “Earthquake” Sundae. 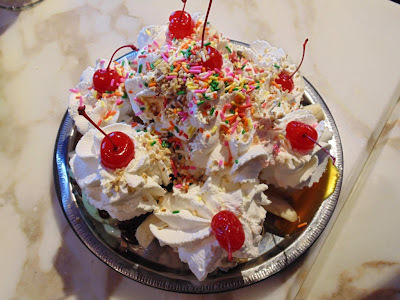 Featuring eight scoops of ice cream, eight delicious toppings, fresh bananas, whipped cream, chopped almonds, decadent chocolate chips and maraschino cherries. I must say it was most definitely #onolicious. 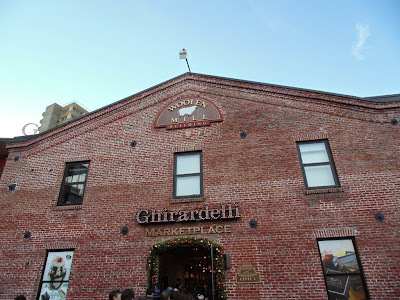 Below is a bonus photo of one of the buildings at Ghirardelli square. I like how the architecture reminder you of chocolate.